Britain's Coldplay could be the last best hope to follow in the footsteps of the Beatles, Led Zeppelin, and U2." There it is folks, a generational shift has occurred. The "Big Three" used to be, without exception, The Beatles, The Rolling Stones and The Who. Now the "Big Three" are The Beatles, Led Zeppelin and U2. 'Nuff said. Stuck in a Moment, originally uploaded by dreadfuldan. ''Music you do in private,' he says by phone. ''But ring tones become a public display, like a pair or sneakers or a T-shirt. People are going to use ring tones as a real expression of what they're about.'" 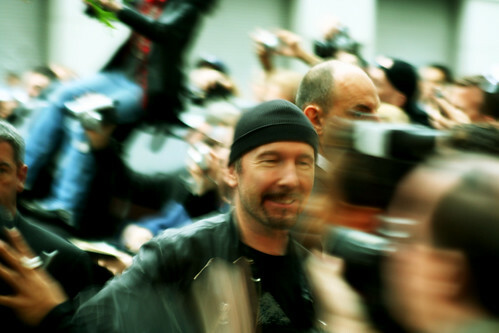 My Zooropa ringtone went off in church during my niece's Baptism...The Edge would have been so proud. Taser's electrifying new XREP shotgun-fired projectile - Engadget: "Police will soon have a new weapon in their growing 'non-lethal' arsenal in the form of a Taser-brand, shotgun-fired projectile that nearly quadruples the range of traditional stun guns while maintaining the same immobilizing-goodness we've come to expect from Taser products." So, they will let us buy CDs of music, but not transfer the music to another medium for our own use? Now I don't feel bad for all those tunes I downloaded from Napster long ago. It's so sad it's funny. By KORI SCHAKE "In the wake of 9/11, it made sense to let defense spending mushroom to deal with new threats without cutting existing programs. But having worked on defense strategy and resources in the Pentagon and the National Security Council over the last decade, I'm now convinced that was a mistake. Increasing the Department of Defense's budget 35 percent since 2001 prevented it from making hard trade-offs between what it prefers to do (continue existing weapons systems) and what the nation most needs (an agile force that can quickly defend us against terrorists). The Pentagon's budget is larger than the next 18 defense budgets in the world. Of course, it's not surprising that the United States has the highest defense spending by a substantial margin, but the magnitude relative to potential enemies suggests we are not achieving our objectives in a cost-effective way. The exchange ratio between what it costs, say, Al Qaeda to mount a terrorist attack and what we are spending to prevent or respond to them is not a hopeful prospect for our country in a long war. The central challenge for hegemonic powers is to avoid being stretched too thin by either taking on too many obligations or supporting them in an unsustainable way. In the 1950's, President Dwight D. Eisenhower justified his arbitrary cap on defense spending by saying that military force could freeze the confrontation while our real strengths of ideology and economy won the cold war." They were loyal conservatives, and Bush appointees. They fought a quiet battle to rein in the president's power in the war on terror. And they paid a price for it. A NEWSWEEK investigation. "For nine months, from October 2003 to June 2004, he had been the central figure in a secret but intense rebellion of a small coterie of Bush administration lawyers. Their insurrection, described to NEWSWEEK by current and former administration officials who did not wish to be identified discussing confidential deliberations, is one of the most significant and intriguing untold stories of the war on terror. These Justice Department lawyers, backed by their intrepid boss Comey, had stood up to the hard-liners, centered in the office of the vice president, who wanted to give the president virtually unlimited powers in the war on terror. Demanding that the White House stop using what they saw as farfetched rationales for riding rough-shod over the law and the Constitution, Goldsmith and the others fought to bring government spying and interrogation methods within the law. They did so at their peril; ostracized, some were denied promotions, while others left for more comfortable climes in private law firms and academia. Some went so far as to line up private lawyers in 2004, anticipating that the president's eavesdropping program would draw scrutiny from Congress, if not prosecutors. These government attorneys did not always succeed, but their efforts went a long way toward vindicating the principle of a nation of laws and not men." "Why is it not bigger news that those infamous Iraqi female scientists, once routinely referred to in the media as "Dr. Germ" and "Mrs. Anthrax," have been quietly released from imprisonment in Iraq without any charges being brought by their U.S. captors? Don't the newspapers and TV networks that all but preconvicted them of crimes against humanity owe them -- and us -- the courtesy of an explanation for the sudden presumption of their innocence? After all, it was to stop these mad leaders of Saddam Hussein's allegedly booming weapons-of-mass-destruction programs that the United States invaded Iraq in March 2003. We were told at the time by the White House that the U.N. inspectors scouring the country were being blocked by lying officials and scientists, themselves complicit in breaking U.N. sanctions, and so we wouldn't get the truth until we could interrogate them as prisoners. Yet, when Rihab "Dr. Germ" Taha and Huda "Mrs. Anthrax" Ammash, both of whom were once on a Pentagon most-wanted list, were released after two and a half years, their U.S. captors didn't even announce it." The rock gods snatched Grammy history from the comeback queen Wednesday, as perennial favorites U2 took home five trophies while Mariah Carey had to settle for three. "Bono took pains to praise Bush for US generosity around the world, saying that Washington could have "drawn the blinds and double-locked the doors" after the September 11, 2001 attacks. "You should be very, very proud. But here's the problem: There's so much more to do. There is a gigantic chasm between the scale of the emergency and the scale of the response," said the singer. Bush gave no sign he would meet Bono's request, but praised him as "a doer. The thing about this good citizen of the world is he's used his position to get things done. You're an amazing guy, Bono. God bless you." "Again, Ireland may be the model for an answer. After centuries of wishing themselves on to other countries, the Irish found that education, rational government, people staying put and simple diligence could turn Ireland from an economic basket case into a prosperous nation. In a word — are you listening, Mr Hewson? — the Irish have proved that there is something to be said for staying home." "He wasn't just talking about the American dream," Bono said. "It was a much bigger idea, actually, an idea that could fit an African dream, an Irish dream. And it certainly wasn't a daydream. It was a call to action." At the dinner, which had a sellout crowd of 1,900 at the Hyatt downtown, Coretta King called Bono "another son for me now. We officialized that today."